2018 was the 1300th anniversary of the first temple being built on Mt. Daisen, a famous mountain in Tottori and the tallest mountain in the Chugoku region. This press tour covered the lifestyle of the people living around the foot of Mt. 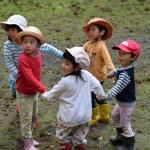 Daisen, with their rich history and culture of giving thanks to the bounty of the mountain. 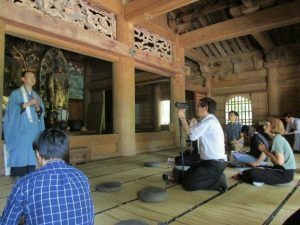 A total of 11 journalists participated in the tour, from Bangladesh, Denmark, Hong Kong, South Korea, Switzerland, Vietnam, and from an English magazine published in Japan for foreigners living in Japan. 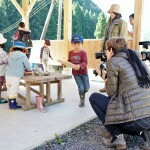 *This press tour was sponsored by the Tottori Prefecture Tokyo Office, and planned and operated by the FPCJ. 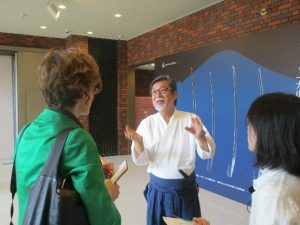 While listening to explanations from Mr. Shikun Morii, a sword polisher who lives in Yonago, the tour saw various famous swords with a connection to Mt. Daisen, such as pieces by Hoki Yasutsuna, a master swordsmith of the Heian period (794–1185). Mr. Morii told the journalists that high-quality iron sand was plentiful around Mt. Daisen, and was used to make the steel used in Japanese swords, so it was only natural that the wonderful tradition of Japanese swords started from there. 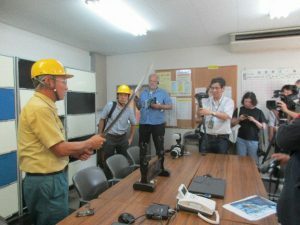 The journalists asked about the process for making Japanese swords, the unique characteristics of swords made around Mt. Daisen, what led Mr. Morii to become a sword polisher, what he felt was important in sword polishing, and his future goals. At the oldest building in Daisen Temple, the Amida-do, the tour group heard about the history of Mt. Daisen as a place of worship from Goken Shimizu, head priest of Kansho-in, a branch temple of Daisen Temple. The journalists asked questions including why the general public was forbidden from entering Mt. 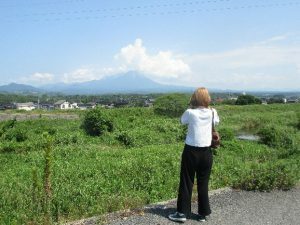 Daisen in the past; what the difference was between Mt. 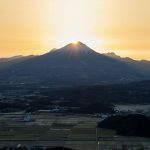 Daisen and Fuji, another focus of mountain worship; whether women were forbidden from entering Mt. Daisen; and how Daisen Temple resisted the Meiji government’s 1868 policy to separate Shinto and Buddhism (largely by destroying Buddhist temples and objects). 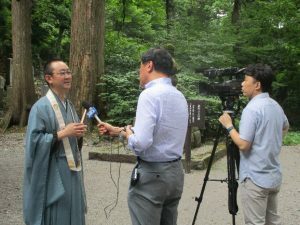 One journalist asked about the future of Buddhist temples in Japan, as the Buddhist funerals which were the norm become less popular. 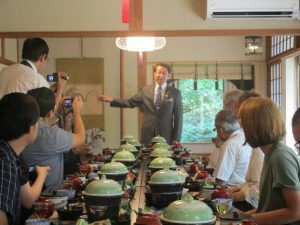 At Shukubo Kansho-in Temple Sanrakuso, the tour group tried shojin ryori (Buddhist cuisine) made from mountain vegetables while interviewing Tottori Governor Shinji Hirai. Considering that Tottori, the prefecture with the lowest population in Japan, has been successful in staving off population decline by carrying out active support of families with small children, the journalists asked questions about what kind of support for raising children had been provided so far; what issues local governments should deal with first when facing population decline, decreased birthrate and an aging population; what policies were implemented to increase employment, an important factor in attracting people to move to the area; and how many people have moved to Tottori from other countries. The tour filmed and photographed Mr. Takayuki Nakamura as he was freediving. Mr. Nakamura moved from Saitama to Daisen Town, where he now makes his living by freediving for seafood. 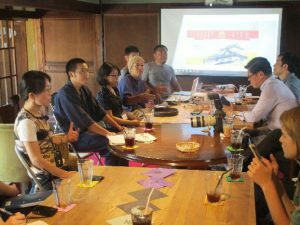 Afterwards, the journalists spoke with the members of the Kizukikai, an organization composed mainly of people who relocated to Daisen, at the community space Mabuya. The journalists asked questions including whether any foreigners had relocated to Daisen, why such a large percentage of people who moved to Daisen relocated there permanently, what kind of support the Kizukikai provided to help relocatees become part of the local community, and whether they had been concerned about medical support or education when moving to a rural area. 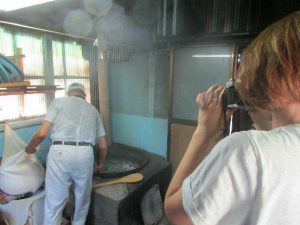 The tour covered traditional tofu-making using soybeans grown in the rich soil around Mt. Daisen and the delicious water flowing from Mt. Daisen. 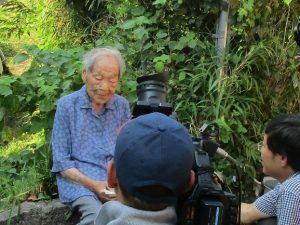 Ms. Tomiko Tanio (107 years old), one of the original members who was involved when residents decided over 60 years ago to make tofu as a community, came while the journalists were at the tofu hut. 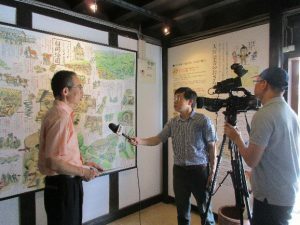 Journalists asked questions including how the ingredients were acquired, what led to the residents of this district deciding to make tofu as a community, why they continued to make tofu, and how the taste compared to the tofu bought at the grocery store. 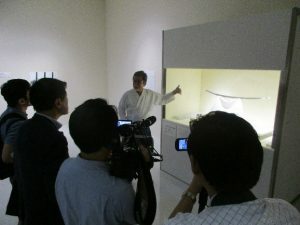 The journalists then had the opportunity to taste some of the freshly-made tofu. At the Tatara no Gakko museum in Neu, Hino, the Vice Chair of the Hokinokuni Tatara Kenshokai, Mr. Yukito Sasaki, explained about the history of tatara iron making, a traditional Japanese technique for making iron which was carried out in the Okuhino area. 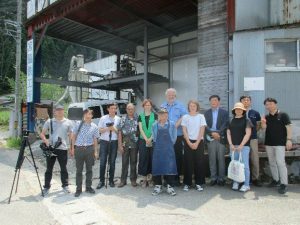 The journalists asked questions about how tatara iron was different from iron made normally, whether there were any plans to apply to the UNESCO World Heritage List, who carried out the work for tatara iron making, and what response was made to imports of Western iron. The tour then visited Blacksmith Workshop Miyamitsu, also in Hino, and saw a blacksmith as he forged a knife. 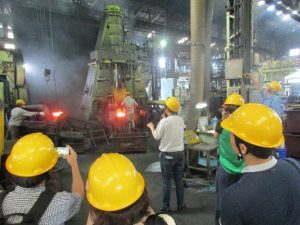 The tour was given an overview of Kikusui Forging, a company with its roots in the manufacture of Japanese swords, from company president Mr. Takashi Moriwaki, before touring the factory where bicycle parts, machine parts, and more are forged. 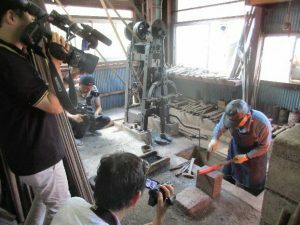 The journalists intently filmed and photographed a master craftsman as he used a large hammer on red-hot metal. The tour also visited the Japanese sword forge the previous company president (also the founder), who was a swordsmith, had used. 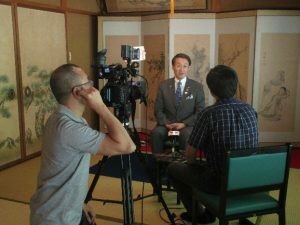 The journalists asked questions about business strategies for Japanese craftsmanship in the face of harsh economic realities, and about strategies for training staff to pass on advanced techniques and the craftsman spirit.